Recent reports have suggested that food companies have been misleading us about the 'healthiness' of higher fibre foods - so what's the deal? Are high fibre foods laden with hidden calories, or is it just media hype? 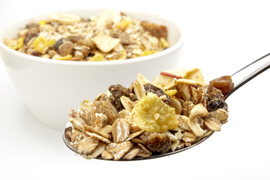 After years of being told that we should all eat more fibre to lose weight and stay healthy, we are bombarded with headlines such as 'Fat chance of slimming' (The Independent Feb'13) and 'Time to Ditch the Muesli' (Daily Mail Feb'13). Reports that food labelling does not take into account the calories that fibre contributes to our diets have suggested an underestimation of the calorie content of foods that are high in fibre. So, for example, a muesli or other high fibre breakfast cereal could be higher in calories than we think, which in turn could mean over consumption of calories, and ultimately no weight loss. So should we be rethinking what we eat, and reducing the amount of fibre in our diets? The dictionary definition of a calorie is 'the energy needed to raise the temperature of 1 gram of water through 1 degree C'. So it's a measure of energy, and something that we, as dieters rely on to see how everything balances out at the end of the day. We tend to use the term kilocalories (kcal) when we talk about calories in food, and this is the term you'll find on food labels. Different foods provide different levels of calories . Carbohydrate and protein provide us with 4 kcal per gram, whereas alcohol gives us 7 kcal per gram (no, it's not calorie free unfortunately!) and fat, a whopping 9 kcal per gram. Our understanding of calories came from ground breaking work from a scientist in the 19th century. At that time, and for many years since, fibre was thought to remain undigested through the body meaning it was calorie free. More recently it was discovered that there are two different types of fibre - soluble and insoluble. Insoluble fibre is the stuff that helps to bulk out our diet, fills us up and keeps us 'regular'. Soluble fibre has a different role - as its name suggests it can be digested, and absorbed into the body, and may help to reduce the amount of cholesterol in the blood. Most fibre-containing foods contain a mixture of both sorts of fibre, and good sources include fruit, vegetables, wholegrain rice, wholegrain pasta, wholemeal bread, wholegrain breakfast cereals, seeds, nuts, lentils, beans and oats. Because we now know some fibre can be digested, it makes sense that it should have an energy value. More recent research has discovered that fibre provides us with approximately 2 kcal per gram. What does this mean for calorie calculations? In reality, the fact that fibre does actually contribute some calories makes little difference to our overall calorie intake. If you imagine that you are eating the current recommendation of 18g of fibre per day - this would give you an extra 36 kcal per day (assuming that the product you're eating hasn't already had the fibre calories added on!). Some would argue that 36 kcal per day over the course of a year is actually quite a lot, and could lead to weight gain, however this is unlikely in the grand scheme of things. The truth is that companies haven't been deliberately misleading us - it's all down to evolving science, better ways of testing, and new laws on labelling. Many companies will have already taken the change in calorie labelling into account, and fibre calories will already be showing on the labels. For those companies that haven't, this will soon be changing. So should I ditch the muesli? Absolutely not! If you are eating a high fibre breakfast cereal, or fibre laden bread, don't stop having it! The health benefits from having a high fibre diet far outweigh any slight increase in calories that this might give you. Remember that it's all about balance so make sure you're eating foods from all the different food groups, and aiming for fibre rich foods where you can. Maintaining a full and accurate diary, being as active as you can and keeping sight of your goals will all help you to get to reach your desired weight sensibly, and to keep it off!